NETHERLANDS: Van Oord has installed all 150 monopile foundations at the 600MW Gemini offshore project a month ahead of schedule. 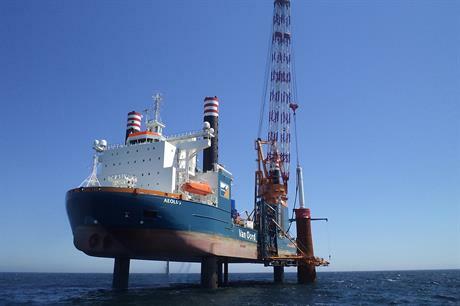 Van Oord said the installation was completed in less than four months. The first monopile was put in on 1 July 2015. The company said its Aeolus vessel and Swire Blue Ocean's Pacific Osprey vessel will return to the project site in February 2016 to begin installation of the turbines. Van Oord is the project's engineering, procurement and construction (EPC) contractor. German fabricator EEW SPC and Dutch engineering firm Sif Group each supplied 75 monopiles. The project is owned by Canadian operator Northland Power (60%), Siemens (20%), Van Oord (10%) and HVC (10%). It is due for completion in 2017 using 150 Siemens 4MW turbines. Van Oord also installed two project offshore substations in August.